In 1895, Lucille (Hunter) Mahannah was born in the southeast corner of an adobe brick home in northern Fruita, Colorado. The house was part of the once prominent Hunter Ranch on 21 and J Road, land opened up by the Reclamation Service after Lucille’s father had first come to Mesa County to settle from Florida in 1880. The Grand Valley Canal cutting through the Grand Junction area. Photo source: The Grand Heritage by Dave Fishell. Lucille learned to swim in the Grand Valley Canal and was baptized at the age of twelve in the Colorado River off the banks of Fruita. These events, along with the endless hours spent horseback riding around the countryside, no doubt spurred her lifelong interest in the conservation and protection of Mesa County’s many natural resources. In the early 1900’s, it was a bit unusual for women to be included in a group that often spent their time getting dirty camping, hunting, fishing, and working outdoors. Lucille helped with many efforts while a part of the League, including cleaning up the ditch, banks, and flower gardens in Palisade. 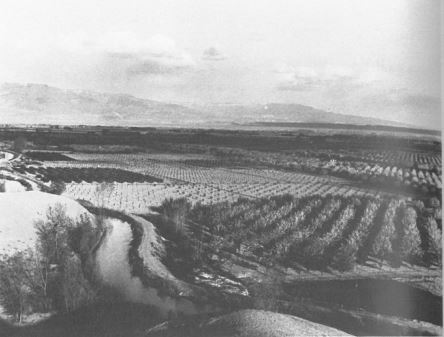 During the 1930’s, one of the projects she was most passionate about involved protecting the Colorado River against pollution by creating and maintaining sewage disposal areas. The sewage was processed properly in a different location instead of getting dumped directly into the river, which was an outstanding development of its time. In 1930’s Mesa County, the Izaak Walton League took great care in attempting to “blend the interests of cattlemen and sheepherders in the high mountain areas” to help prevent soil erosion and promote the seasonal growth of certain grasses. A specific seed was provided by the Bureau of Land Management that would further assist their efforts. Lucille’s love for Mesa County and the great outdoors led her through an interesting life, working as the Mesa County Director of Public Welfare in 1939, the Mesa County Volunteer Coordinator in 1947, and finally the County Superintendent of Schools from 1948 to 1963. She was one of the many hardworking, intelligent women who undoubtedly served a large purpose in the positive evolution of Mesa County.